People Aren't Really 'Lost' ... Are They? Alford Usher Soord (1868-1915), "The Lost Sheep"
Friends gathered for the funeral of a 21-year-old who died in a motorcycle accident. They didn't seem to connect with Jesus' words that I spoke that day. They did connect, however, with the release of helium balloons that a family member had arranged after the service was over. That spoke to them. They weren't Christian believers, so far as I could sense. Nor, from all reports, was the deceased a follower of Christ. He died without knowing Christ. He was lost — or was he? "Lost" is an embarrassing concept that should be thrown on the scrap heap of bad doctrine along with "hell." Instead, Christianity should stress love. A loving God couldn't assign people to hell. Hell is a contradiction of Christianity's basic theme of love. Therefore, there can be no hell in God's world. Consequently our deceased loved ones must be in a heaven of some kind. It follows that no one can be lost. Everyone will make it to heaven, except maybe really bad people like Hitler. This point of view is called universalism. It's popular, even with many who call themselves Christians. But how do we know whether universalism is or is not a Christian view? Did Jesus teach that people can be lost? If so, what does "lostness" consist of? And how can people be "found" or "rescued," whichever is the appropriate concept? Salt that has lost (mōrainō) its savor (in Matthew 5:13 and Luke 14:34; Mark 9:50, "become unsalty"). Lost (apollumi) sheep of the house of Israel (Matthew 10:6; 15:24). Son of man has come to save that which was lost (apollumi, Luke 19:10 — and Matthew 18:11 in some manuscripts). 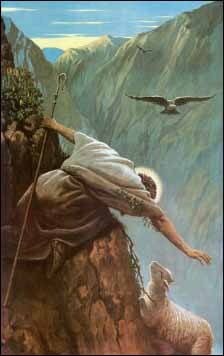 Parable of the Lost (apollumi) Sheep which the shepherd searched for (Matthew 18:12-14; Luke 15:3-7). Parable of the Lost (apollumi) Coin which a woman scoured her house to find (Luke 15:8-10). Parable of the Lost (apollumi) Son, often referred to as the Prodigal Son (Luke 15:24, 32). Gathering up fragments of bread so that none be lost (apollumi, John 6:12). None of the disciples is lost (apollumi), but only Judas, referred to as the son of "perdition" (a related word, apōleia, John 17:12; 18:9). I think we can agree that in #1 and #7 above, Jesus isn't talking about lost people, but the other six passages he most certainly does. The Key Word: apollumi, "Lost"
To cause or experience destruction. In the Active Voice apollumi means "to ruin, destroy, kill, put to death." In the Middle Voice it means "to perish, be ruined." This encompasses dying by storm at sea, by the sword, killed by snakes, and especially of eternal death (John 10:28; 17:12; Romans 2:12). It is used most famously in John 3:16: "For God so loved the world, that he gave his one and only Son, that whoever believes in him shall not perish (apollumi), but have eternal life." To fail to obtain what one expects or anticipates, "lose out on, lose," as in lose one's reward. So how does Jesus use this word in the "lost" passages? In the context of these parables he makes it pretty clear. By "lost sheep of the house of Israel" then, Jesus is referring to Jewish sinners, that is, Jews who haven't yet repented of their sins. These people who believe in the Jewish faith, but who have strayed away, who are no longer following their faith, and who are in danger. In some manuscripts, at least, Jesus repeats this saying in the immediate context of the Parable of the Lost Sheep (18:10-14): "For the Son of man is come to save that which was lost" (Matthew 18:11, KJV, Textus Receptus). This lost sheep "went astray" (planeō, "wander"). It goes off by itself in the steep ravines and gullies and becomes separated from the flock and the protecting shepherd. This "lost sheep" will be eaten by wild animals if left to itself. So the shepherd scours the hills until he finds it. In Matthew the "punch line" for the parable is this: "In the same way your Father in heaven is not willing that any of these little ones should be lost" (NIV, NRSV) or "perish" (KJV, apollumi, Matthew 18:14). This is the equivalent of saying, "God does not will" the perishing of any of them.3 The phrase "these little ones" here seems to refer to either children or disciples who are being lured by sin and temptation (Matthew 18:6, 10, 14). Jesus' teaching here sounds a great deal Peter's teaching decades later: "He is patient with you, not wanting anyone to perish (apollumi), but everyone to come to repentance" (2 Peter 3:9). The point of this parable is finding and thus protecting sheep that otherwise would die from the elements or be ravaged by enemies. "Finding sheep" is obviously the act of rescuing or saving them. In other words, the lost sheep and lost coin refer to a sinner who needs repentance, while the found sheep and found coin refer to a sinner who repents. Jesus, of course, is referring to Judas who betrayed him. It is pretty obvious that Jesus is talking about preserving a person for eternal life, which is the opposite of being lost in eternal death — one "doomed to destruction" or in the KJV "the son of perdition." Summary of Jesus' Teaching on the "Lost"
Jesus' use of "Lost." On a number of occasions Jesus used the word "lost" to refer to unrepentant sinners who weren't seeking to please God. He used the word "found" in parables to refer to sinners who had repented and turned back to God. When you look at the scripture texts, this is crystal clear. I conclude that "lost" refers to unrepentant persons who will miss out on eternal life unless they are "found," that is, rescued or saved and brought to a place of repentance and forgiveness. Jesus' teaching on lostness is unambiguous. Now it is a question of whether we want to believe it or not. Do we follow our ungodly culture that has a strong motivation not to believe in hell and eternal lostness? Or do we believe Jesus, the Son of the God, who reveals to us true nature of spiritual realities? If I have been accurate in explaining how the word "lost" is used by Jesus — and I invite you to check me out to be sure that I have done this carefully — then we followers of Jesus, we believers in Jesus' teaching, must embrace Jesus' concern for the lost — those who are doomed to miss out on eternal life unless they are "found" or "rescued." For too long many of us Christians have been embarrassed by the word "lost." For too long we have banished it not only from our vocabularies, but have dropped rescuing "lost" people from our church priorities. We have succumbed to group-think and in the process have gotten badly off target. Let us recover Jesus' true heart towards the lost. To do this, first we must be willing to accept Jesus' own teaching that people are actually "lost" eternally without his salvation. Second, we must adopt Jesus' own passion to "seek and to save the lost." Only then can we be classed as "followers" in this crucial part of Jesus' mission. Only then will be truly loving to those who are lost. Of course, Jesus probably taught in Aramaic. However, what we have are the early Gospels prepared in Greek by and from eyewitnesses of Jesus. By using comparisons from the second century BC Septuagint Greek translation of the Old Testament, we find that the Hebrew root behind apollumi is �ābad, "perish, be destroyed" (R. Laird Harris, �ābad, R. Laird Harris, Gleason L. Archer, Jr., and Bruce K. Waltke (editors), Theological Wordbook of the Old Testament (TWOT; 2 volumes, Moody Press, 1980). Apollumi, Walter Bauer and Frederick W. Danker, A Greek-English Lexicon of the New Testament and Other Early Christian Literature (BDAG; Third Edition; based on a previous English edition by W.F. Arndt, F.W. Gingrich, and F.W. Danker; University of Chicago Press, 1957, 1979, 2001), pp. 115-116. Leon Morris, The Gospel According to Matthew (Pillar Commentary Series; Eerdmans, 1992), p. 466. Albrecht Oepke, apollumi, ktl., Gerhard Kittel and Gerhard Friedrich (editors), Geoffrey W. Bromiley (translator and editor), Theological Dictionary of the New Testament (TDNT; Eerdmans, 1964-1976; translated from Theologisches Wörterbuch zum Neuen Testament, ten volume edition), 1:394-397.